forklift and other mobile equipment operators. 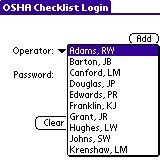 Automated wireless OSHA Checklists ensure that each operator verifies that all critical mobile equipment components are in proper operating condition at the start of each shift. Reduce maintenance cost while improving safety! Takes just a few seconds each day. Centralized database allows detailed analysis and record archiving. Palm-based handheld solution for forklift and other mobile equipment checklists. Completely mobile solution exceeds all OSHA requirements for pre-operational equipment checklists. Wireless transmission allows central data collection for real-time verification, maintenance scheduling, equipment tracking, and other purposes. Can be integrated with other existing systems. Allows operators to quickly and easily verify correct operation of all systems on forklift or other equipment items at the beginning of each shift, allowing full compliance with OSHA safety regulations. Can be used to pre-authorize operators to use equipment, based on their individual certifications and training. Collects operating hours for each forklift or other equipment for planned maintenance scheduling. Collect specific repair needs, to schedule maintenance and keep equipment in optimal condition. 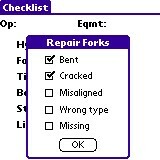 Data is returned to a central PC for collection of checklists, dispatching of repairs, and planned maintenance. Includes comprehensive PC-based program to enter operator names, equipment types, checklist items, repair items, training records, etc. 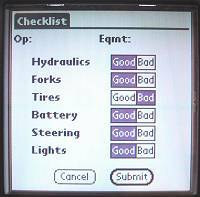 Runs on Symbol™ factory-hardened handhelds, or any Palm OS compatible device. Can also be integrated with barcode scanning software for inventory, reading employee badges, location tracking, maintenance, etc. 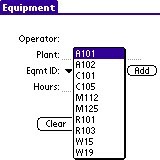 Priced individually, by location, or by company (customization services available to interface with existing CMMS systems). Detailed reports for planned maintenance, utilization, safety records, repair history, and many others. Can be fully customized or productized for forklift or other mobile equipment manufacturers such as Mitsubishi, Crown, Raymond, Hyster, Clark, Toyota, Yale, etc. OSHA 29CFR 1910.178(q)(7) requires that appropriate safety checks are completed at the beginning of each shift. Now you can verify full compliance. Improve safety, reduce repair times, and reduce liability by ensuring that EVERY piece of mobile equipment is adequately inspected before use. In addition, overall fleet maintenance is greatly enhanced by tracking actual hours of operation for each piece of equipment. Planned mainte-nance reduces overall operating costs, and reduces the likelihood of accidents.